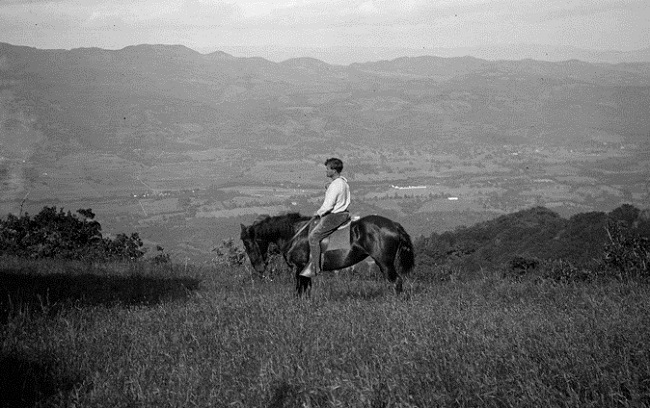 Jack London riding through his ranch in Sonoma Valley, undated photo. Image courtesy of the Jack London State Historic Park website. In March 1905 Jack London ran, for a second time, as the Socialist candidate for Oakland city mayor and placed last in a field of four contenders, with 981 votes of the 11,429 cast. He decided to leave the East Bay area and, flush with his recent success as a best-selling author, he bought a ranch near Glen Ellen in the Sonoma Valley. At about the same time, he and his first wife, Bess London, finalized their divorce, and on November 19 he married Charmian Kittredge. While he continued to travel extensively (usually with Charmian), London expanded “Beauty Ranch” to more than 1,100 acres and retained it as his home base for the remainder of his short life. During his last decade London expanded the boundaries of his fiction beyond the naturalism of his early writing, and his final novels and stories include science fiction, supernatural tales, and experimentation with technique. 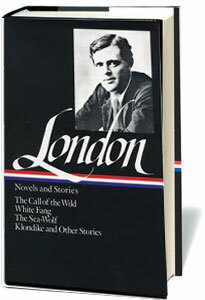 “Even though London’s life in the bucolic setting of Sonoma Valley may seem far from an experimental context, in fact his ranching innovations and his new approaches to writing went hand-in-hand,” writes literary scholar Jeanne Campbell Reesman in her survey of his short fiction, and she singles out “Told in the Drooling Ward” as “one of London’s unique experiments with point of view.” In this case, the connection between London’s rural home and the subject of the story is direct: The narrator is a resident of a mental institution, and London’s ranch abutted the grounds of the California Home for the Care and Training of the Feeble Minded (which changed its name to the Sonoma State Home in 1909). Moreover, part of the story actually takes place on Beauty Ranch—and London and his wife, thinly disguised, make cameo appearances. The Londons were well known to the Home’s staff and residents, and they appear to have visited the facility with some frequency. In November 1911 London sent a draft of “Drooling Ward” to Dr. William Dawson, the medical superintendent, who replied with a brief letter: “I have read the article with a great deal of interest and find it in greater part to be true to life. The ‘hero’ of the story I think is our old inmate, Newton Dole.” Dawson also let London and his wife know that the residents of the home were staging a musical the coming weekend and, enclosing a copy of the program, he invited them both to attend. A hundred years later the institution, now the Sonoma Developmental Center, is still in operation. At its peak, the campus had nearly 1,700 acres, 145 buildings and 3,400 residents and, the largest employer in Sonoma Valley, it operated as a town unto itself. London’s story depicts the facility in a favorable light, but its history in the intervening century has been peppered with scandal and controversy, including the forced sterilization of more than five thousand residents from the 1920s through the 1950s, allegations of lethal medical experiments on children with cerebral palsy in the late 1950s, and (most recently) the use of Tasers on patients with disabilities. During the last four decades the facility has greatly reduced the size of its population and its grounds, and in 1999 nearly 700 acres were transferred—fittingly enough—to the adjoining Jack London State Park. The state government recently announced plans to shut down the center and place its remaining 400 residents with smaller, more personal group homes. Me? I’m not a drooler. I’m the assistant. I don’t know what Miss Jones or Miss Kelsey could do without me. . . . If you don't see the full selection below, click here (PDF) or click here (Google Docs) to read it—free!